Richard G. Folda, 93, of Schuyler, died Saturday, November 26, 2016 at CHI Health Schuyler. Thursday, 8:30 a.m. to 10:15 a.m.
Richard was born October 9, 1923 in Schuyler to K.J. and Tillie (Pakes) Folda. He attended Schuyler Schools and graduated from Schuyler High School Class of 1941. In 1943 he became an Army Air Force pilot and flew B24’s, B 25’s and B29’s during World War II. On July 19, 1949, he married Marianne Srb at St. Mary’s Catholic Church in Lincoln. Following graduation from the University of Nebraska College of Law in 1949, he joined his father in operation of the Folda Insurance Agency and the Schuyler Federal Savings and Loan Association and practiced law as well. Folda has served as president of Heritage Federal Savings Bank, the Nebraska Savings and Loan League and of the four-state Midwest savings conference. For eight years Folda served as Schuyler City Attorney. For many years he served as president of the Schuyler Board of Education and the Nebraska State School Board Association. He has been a member of the Board of Directors of the UNL Touchdown Club for 30 years. Folda has also served as president of many local organizations including Divine Mercy Parish Council, hospital board of directors and hospital foundation board, and the Schuyler Golf Club Board of Directors. 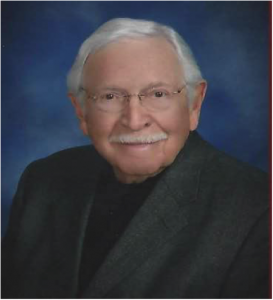 Folda was a board member of the Nebraska State Bar Foundation and Schuyler Community Development, Inc.
Two grandsons: John R. Theisen and Andrew J. Theisen of Norfolk. Preceded in death by parents,wife, Marianne, infant brother Gerald Folda, who died in the 1918 flu epidemic.